If the omission does not change the meaning of the original quote, why omit those three words in the manual? It’s pretty clear from looking at the paragraph in the manual that there was still room for those three words. It was not for a lack of space that the editor or editing committee chose to omit those three words. 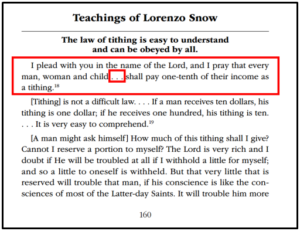 If Lorenzo Snow were reading that manual, would it matter to him how he was being quoted? Which of these two quotes comes closer to aligning with JST Genesis 14 and D&C 119? 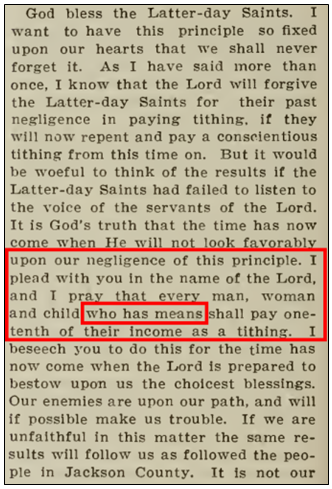 Coming back to D&C 119, let us look at what the Lord said the purpose of the tithe is. D&C 119:2: For the building of mine house, and for the laying of the foundation of Zion and for the priesthood, and for the debts of the Presidency of my Church. This seems pretty straight forward, at least most of it does. We build temples and meeting houses with tithing funds. However, the Church is in a much different financial situation now then when this revelation was given. I don’t believe the same debts of the Presidency exist as they once did. According to President Hinckley’s April, 1991 address, the Church’s ecclesiastical operations have no debt. But what is meant by the other phrase, ‘laying the foundation of Zion’? How does tithing help lay a foundation of Zion? Moses 7:18: And the Lord called his people ZION, because they were of one heart and one mind, and dwelt in righteousness; and there was no poor among them. If tithing is for laying the foundation of Zion, is it reasonable to expect that the law should not, at a minimum, create poor among them? If someone were to join with the saints, and at the time had just enough property/income to sustain themselves, a requirement of one-tenth of all they possess could cause them to be considered poor; no longer able to sustain themselves. Furthermore, the required one-tenth of their income annually from that point on could keep them among the ranks of the poor, or further impoverish them. 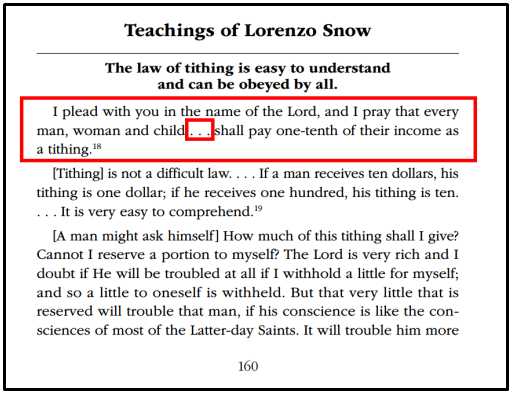 Is there an understanding of the law of tithing that conforms to the requirements of Zion? What about those who are already poor when they join the saints? Does the tithe assist them in any way? JST Genesis 14 indicates that one of the purposes of the tithes is for the poor. It makes little sense to require tithes of the poor, only to turn around and give even more tithes right back to them. Mosiah 4:24: And again, I say unto the poor, ye who have not and yet have sufficient, that ye remain from day to day; I mean all you who deny the beggar, because ye have not; I would that ye say in your hearts that: I give not because I have not, but if I had I would give. What about the warning from Malachi that’s also repeated in 3 Nephi 24? Malachi 3:8-10: Will a man rob God? Yet ye have robbed me. But ye say, Wherein have we robbed thee? In tithes and offerings. Ye are cursed with a curse: for ye have robbed me, even this whole nation. Bring ye all the tithes into the storehouse, that there may be meat in mine house, and prove me now herewith, saith the Lord of hosts, if I will not open you the windows of heaven, and pour you out a blessing, that there shall not be room enough to receive it. When discussing tithes in Malachi, the conversation rarely goes beyond these three verses. Let us take a closer look at Malachi to see if we can get the whole story. The book of Malachi is a fascinating explanation of a problem with Israel and her priests that the Lord presents in the form of a conversation. God says: “And if ye offer the blind for sacrifice, is it not evil? And if ye offer the lame and the sick, is it not evil?” (1:8). God is not pleased with the offerings that Israel is giving, and the priests are accepting. He gave them direction that they are not following. Deuteronomy 15:19-21: All the firstling males that come of thy herd and of thy flock thou shalt sanctify unto the Lord thy God: thou shalt do no work with the firstling of thy bullock, nor shear the firstling of thy sheep. Thou shalt eat it before the Lord thy God year by year in the place which the Lord shall choose, thou and thy household. And if there be any blemish therein, as if it be lame, or blind, or have any ill blemish, thou shalt not sacrifice it unto the Lord thy God. The people were giving tithes and offerings. That was not the problem. The problem was that Israel was offering the lame, the blind, and the ill for sacrifices, and the priests were accepting them contrary to God’s will. However, was it really the poor quality of the offerings that angered God? Or was that just a symptom of the real, much larger problem? God is using the polluted offerings as an illustration of their polluted hearts that have turned away from Him. Let’s continue. God uses tithes and offerings to illustrate their attitude of mind and heart behind their giving. Now we get to the curse verse. Malachi 3:9: Ye are cursed with a curse: for ye have robbed me, even this whole nation. “With a curse you curse me, and me you are defrauding—the nation, all of it” (Mal. 3:9,Concordant Version of The Old Testament). Regardless of who’s cursing whom, there’s cursing going on. Now let’s move on to the blessing verse. What was the tithe that was brought into the storehouse used to make? What sort of meat or food (many bible translations such as Young’s Literal, Revised Standard, New American Standard, etc. translate the word “meat” found in the King James as “food”) is found in “mine house”? Leviticus 24:5-9: And you shall take fine flour, and bake twelve cakes… And you shall put pure frankincense upon each row, that it may be on the bread… And it shall be Aaron’s and his sons’; [the priests] and they shall eat it in the holy place…”. It sounds as though it is used to make the bread used in the temple/tabernacle. But was Israel using “fine” flour and “pure” frankincense? Also notice in verse 10 that God promises to open the windows of heaven and pour you out “a blessing.” Singular. 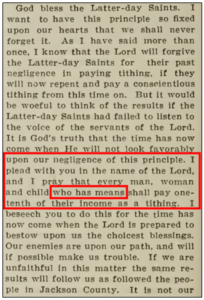 Most of the stories I read or hear about describing “tithing blessings” involve people somehow making financial ends meet when it did not appear they would be able to do so. Is this really the (singular) blessing that there’s not room enough to receive? In those stories spoken of, it seems like the amounts received are often just enough to make up for the deficits. Interestingly, each of those people who were blessed in this manner easily had room enough to receive it – and plenty of spare room to receive more. Is there really a financial blessing you just don’t have room enough to receive? With funds these days mainly being electronic in nature, it’s not that hard to consider adding a few zeros to an account balance. Is there a specific number of zeros at which you would run out of room and could not accept it at that point? I’ve never tested that out, but I’d be willing to give it a try if someone out there wants to add some zeros to my account. This doesn’t appear to fit the promise spoken by the Lord. So what singular blessing could be given that there shall not be room enough to receive it? Could this be a key to understanding the spiritual meaning of this law? John 6:32-33: Then Jesus said unto them, Verily, verily, I say unto you, Moses gave you not that bread from heaven; but my father gives you the true bread from heaven. For the bread of God is He which comes down from heaven and gives life unto the world! It is not uncommon to hear that paying your tithing is paying your fire insurance against the burning of Christ’s second coming. This comes from the following verse of scripture. D&C 64:23: Behold, now it is called today until the coming of the Son of Man, and verily it is a day of sacrifice, and a day for the tithing of my people; for he that is tithed shall not be burned at his coming. Is there more to the meaning of this verse than paying some money to avoid a fire? Let us look closely at how the words ‘tithing’ and ‘tithed’ are used in this verse. Both appear to be used as verbs. From the 1828 Dictionary, the definition of tithe that appears to fit the words’ usage in this verse is “to tax…”, which means to impose or assess; to load with a burden. It makes sense that this day of sacrifice is a day to load with a burden in order to test His people. What is it that the Lord really wants from His people? Is it their 10% gross or net that He is after? Is it their property or money that He’s after? Does He not own it all to begin with anyway? Then what does He really require? Let us look at the verse again, but this time we’ll include the preceding verse. D&C 64:22-23: And after that day, I, the Lord, will not hold any guilty that shall go with an open heart up to the land of Zion; for I, the Lord, require the hearts of the children of men. Behold, now it is called today until the coming of the Son of Man, and verily it is a day of sacrifice, and a day for the tithing of my people; for he that is tithed shall not be burned at his coming. God is the same yesterday, today, and forever. He wants the same thing from us that He wanted from ancient Israel. Psalms 51:17: The sacrifices of God are a broken spirit: a broken and a contrite heart, O God, thou wilt not despise. If we withhold our hearts from Him, our offerings are polluted in the same manner as Israel’s offerings in Malachi’s day. Will we also rob God?